These whopppie pies are adorable! I love something new, it will be great fun experimenting with flavours. 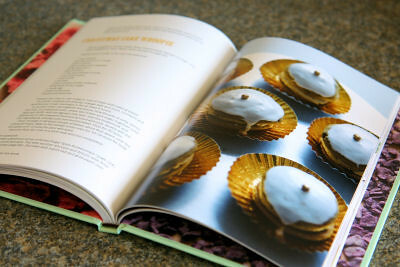 The Whoopie Pie book sounds really lovely. Frozen and chilled whoopie pies sound fascinating. Have to admit that I haven't made a whoopie pie yet. Never knew whoopie pies originated from the Amish! Good to know! I love knowing the history behind dishes and foods. Whoopie Pies must be the next big thing, as I have seen more of them in the world-of-blog during the last couple of days. I will deffo give them a try. I've never made whoppie pies. This version is one I know I would love. 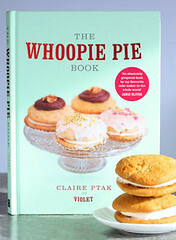 I've seen this book - whoopies are right up there on my to do list! I have yet to have a whoopie pie, let alone make one. 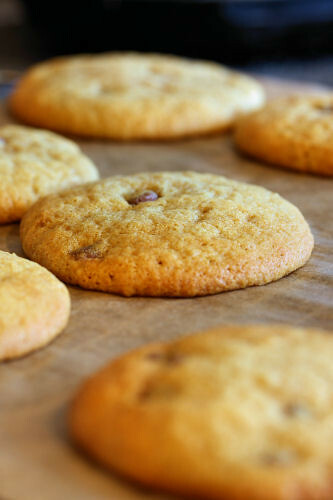 These look really good and the vanilla cream sounds particularly scrumptious. I guess I shall have to make some to actually try one. 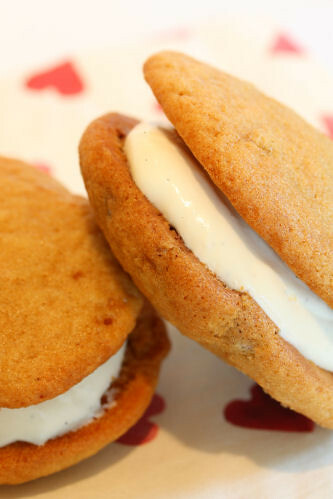 I have never made whoopie pies but yours looks tremendously tasty!! Yummie food! I also tagged you, Nic with 10 culinary questions & come over @ my latest post & check them out! I've never actually had a whoopie pie, though i can see why they're so popular. I've also been meaning to head out to Amish country one of these days and see if the word on the street, that they drive horsecarts and sport long beards, is really true. I wonder if the whoopie filling gets tangled in their facial hair? It's ironic, isn't it, that such an enthusiastically-named confection should come from the Amish who aren't exactly famous for their excitable nature? 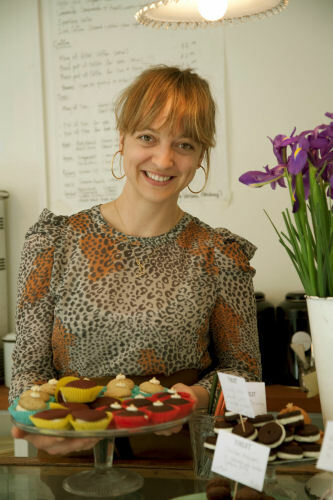 And, they're big in the UK now, bigger than cupcakes, you say? I'm sort of glad cupcakes are getting knocked off their perch. I mean, they're good and all, but they're only sponge cake and some icing in a paper after all. 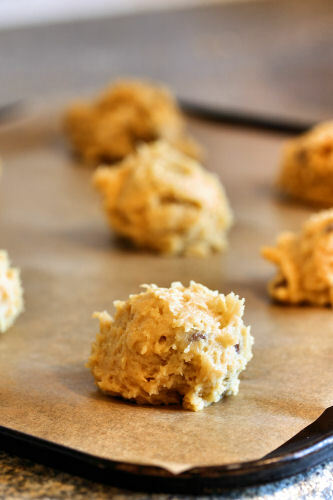 When are good old fashioned scones going to be cool agai? That's what I want to know. It's pretty hilarious no one outside of the US knows what whoopie pies are! But I guess we are making an effort by educating them right? ;) I made matcha ones a while back and they looked like giant green burgers! Now maybe we can figure this out: did Oreos (another sandwich cookie) come after the Whoopie Pie, or, the other way around. 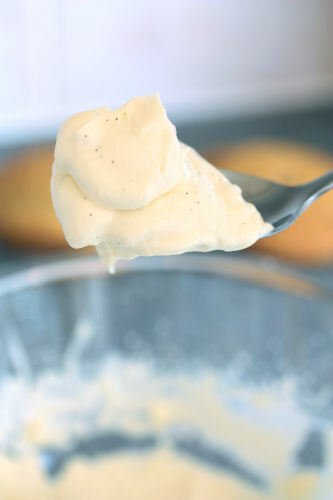 Love the idea of that soft, sweet Vanilla Bean Creme in between the layers. I live in Hong Kong and we cannot get fresh cream. I'm going home to the States for Thanksgiving next week. I know EXACTLY what I'm going to making on my week off. Thanks so much! I do love a good scone - must be the clotted cream - beats icing any day for me! Catty - you must point me in the right direction of matcha green tea, I'd love to give it a go. Denise - that is a question I would love to know the answer to as well! I keep hearing about these but still have not gotten around to trying one, though I do like the sound of the choc chip ones too!